Tammy Salo, Barbara Herting, Elaine Weber and Betsy Chavez. The Stillwater team caught the heaviest basket of fish in the October 6 Save the TaTas fishing competition on Lake Minnetonka. Together, both the Stillwater and Excelsior communities raised over $2,000 to help with research and awareness regarding breast cancer through the Save the TaTas foundation. In that way, both towns with their "Ladies Night Out" events that celebrated the pink cause, won. The teams joined professional anglers, Kevin Kerkvliet and Dean Kaminski in their pink-wrapped Save the TaTas Ranger boats. The four-hour fish-off was great fun for those involved. Darcy Markus, owner of a downtown Stillwater business, Maison Galleria, and one of the anglers on the winning team, was quick to extend an invitation to host the event on the St. Croix in 2012. "We hope we can begin a tradition of inviting our new crosstown friends to do this in the fall next year," shared Markus. "It's a great cause and falls into the time of year where even football players are wearing pink on the field. Why not fish for the cause in these beautiful pink boats in communities where we live and enjoy our time on the water?" Darcy's husband, Jeff, also fished on the winning team, as did Deanna Getschel, owner of Jazz Hair Salon in Stillwater. The West team hosted the fish-off out of Maynard's in Excelsior. The mayor, Nick Ruehl was there to welcome all; Minnesota Vikings cheerleaders also attended to lend support, as did Mrs. Minnesota Yasmine Arellano Ryback. The fancy pink shirts and occasional pink high heels were new looks in the boats. Even the pro fishermen were in the spirit of pink with their Save the TaTas pink logo'd shirts and casting pink spinner baits. "This was a great way for us to show our support for all those touched by breast cancer," shared Kerkvliet, whose Stillwater team turned out the heaviest basket of fish in the two-boat competition. "Having Deanna in the boat with us and knowing all she has been through, ratcheted up everyone's motivation to fish hard-and they did." Getschel has been in her own personal battle with breast cancer since early this year. Glad to have some of the strength back after chemo and radiation, Deanna was thrilled to represent her hometown in this unique event in which the tag line for Save the TaTas is: Laughter Heals. 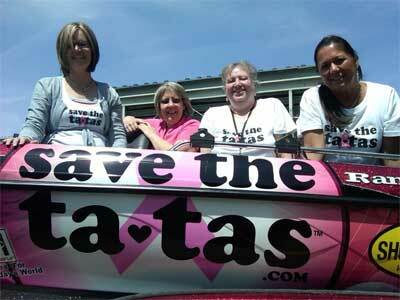 "Some people act put off with the Save the TaTas language," shared Deanna. "But I love it. You have to keep a sense of humor when you're going through something so serious. And let's face it-all women want to save their breasts and their health. So we really mean it when we say 'save the tatas'." Kerkvliet enjoyed Deanna's zest for life in the boat. "Deanna was laughing and having a great time on the water," shared Kerkvliet. "She believes that laughter heals and if doing this together helps her-and others like her-I'm proud to have helped make it happen." Each community raised just over $1,000, double their original goal for the first-year effort. "We're proud of the community and our sponsors," shared Natalie Hagemo, organizer from Excelsior. "With help from MOM.com and Maynard's as well as friends and family members making contributions, this was a super event that fit nicely into our community-wide plan to turn Excelsior pink on October 6th. We even did that on Lake Minnetonka with pink boats and pink lures. How great is that?" Team Excelsior, led by professional angler Dean Kaminski, included professional soccer player and Executive Director of The Sanneh Foundation, Tony Sanneh; entertainment reporter, radio personality and writer, Melinda Jacobs; and Shop NBC host, image and media consultant, Wendi Russo. All team participants received fun prizes including hats, t-shirts, coolers and keychains from the following companies for participating: Minn Kota, Humminbird, Ranger Boats, Frankie's Live Bait, Liddle Marketing Company and Save the TaTas?. The Save the TaTas? Fishing Team sponsors include: Save the TaTas?, Voyagaire Lodge and Houseboats, Ranger Boats, Evinrude, Minn Kota, Humminbird, Liddle Marketing Company, WalleyeCentral.com, Frankie's Live Bait and Marine, Twin City Lawmen, Straightline Construction, Vados Bait and JRs Tackle.